OMG this is an awesome deal! 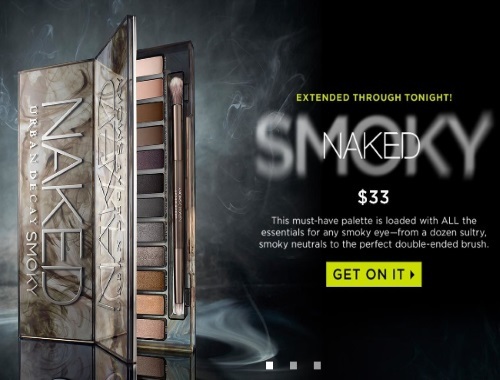 Get the Urban Decay Naked Smoky eyeshadow palette for only $33 (regularly $66). This is a must-have palette that is loaded with all the essentials for any smoky look. I have all the Urban Decay Naked eyeshadow palettes except this one! I definitely recommend them highly! I'd love to get it for Christmas! This offer is while quantities last, it ends tonight (Saturday, December 3, 2016) so be sure to grab it while you can! Free shipping applies to all orders too. $7.95 for shipping comes off at checkout automatically. Click here to shop Urban Decay.